These high chairs are awesome. There are no little cracks and crevices for food to get lodged. You can easily wipe them clean. They take up very little space and when you need to put them away…the legs come off and the tray pops off and viola. Oh and did I mention the trays pop off, oh they do, and then guess what…the chairs fit at the kitchen table! 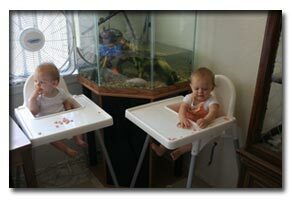 If you have to have more then one highchair this is the way to go. I know, I know…I’m trying to loose weight. 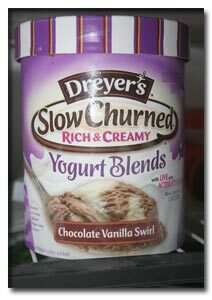 But with 3 grams of fat, 100 calories, and 14 grams of sugar per 1/2 cup this indulgence won’t do me much harm. First I bought it from babyearth Nice site, worth checking out. Shipping is free with orders over 99 bucks. Ok so the stroller, it’s awesome. Easy to open and easy to close…as in no jumping up and down on it to get it to fold all the away. It locks closed on it’s own and has a handle. It’s lightweight and pretty compact when closed too! Oh and the seats are comfy with ample padding and 5 point harnesses. It comes with with strap covers that make it even more comfy. The seats adjust with the pull of up and down quick release straps. I kid you not there are two straps on the back of the seats…you pull the one marked down-down and the seat lays back. The same goes for getting the seat back up. The leg rests adjust too. There’s even something cool about the sun shades; they don’t move back and forth like some do; but you can attach them in two different spots for more sun coverage. The front wheels lock, so if you wanted to say jog with it you could. 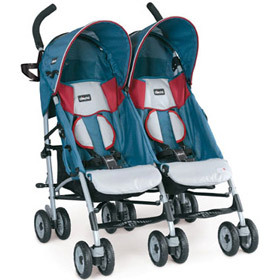 I’ve used the stroller once and so far I am extremely pleased with it. Looooove it!